﻿ How to Free Rip DVD to AVI on Mac? There are times you want to share homemade DVD from Mac to a friend working with Windows platform. Time to convert DVD to digital AVI that is widely recognized by Windows OS. This is where the post comes in, sharing a 100% free solution to rip DVD to AVI on Mac so that you can share the content with your friends. AVI (Audio Video Interleave) was first introduced to the world by Microsoft in 1992 as a multimedia format, and it is among the most common video file formats. Many Mac users need to rip DVD to AVI for various different reasons. Below we list the top reasons for your DVD to AVI conversion and then share the detailed guide on how to free rip DVD to AVI on Mac/PC using the best DVD ripper for Mac. MacX Free DVD to AVI Converter for Mac is an easy-to-control and free DVD to AVI ripping software for all Mac users which can convert and rip DVD to AVI video on Mac (macOS High Sierra and Mojave included) fast while keeping first-rate quality. The converted video is thus compatible with several media players like Android phones, BlackBerry, Windows Media Player, PS4, PS3, PSP, Archos, iRiver, etc and can be uploaded to Youtube, Metacafe, Facebook, etc. 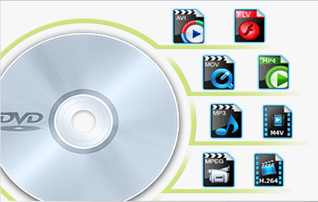 Meanwhile, this free Mac DVD to AVI converter offers an intuitive user interface that requires only 4 steps to finish all the process to rip DVD to DivX/Xvid/H264 AVI- load the DVD or DVD folder, whether it is homemade or protected new movies on DVD, choose the output format AVI, select output folder and press "RUN" button. Below is the detailed instruction on how to rip a DVD on Mac to AVI format freely within a few clicks. Note: The Free DVD to AVI converter for Mac is chosen based on its awesome DVD decryption feature some other free DVD rippers are beyond reach. Unlike other programs that rely on libdvdcss to crack the CSS encoded on DVD, this tool is built in a unique DVD analysis engine that automatically bypass general copy protection schemes like CSS or remove the region code from DVD, so that you can freely rip protected DVDs on Mac to AVI or other format without DVD read error, no valid source found error, and more. 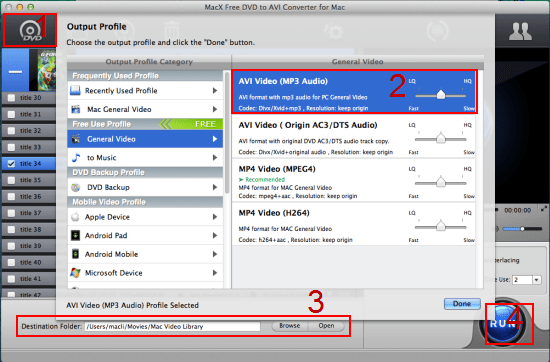 How to Free Rip DVD to AVI on Mac with MacX Free DVD to AVI Converter for Mac? Below is a step-to-step tutorial that guides you through ripping DVD to AVI on Mac with this free DVD converter software. Step 1: Free download free DVD to AVI converter on your Mac, install and run it. Hit "Disc" button to import the DVD files after you insert the DVD disc you want to rip. You can also load DVD folder by clicking "Path" button. This DVD to AVI ripper will automatically choose the right title from the fake ones before DVD to AVI conversion. Step 2: Select the output video or audio format you desire. You could not only rip DVD to rip DVD to DivX/XviD, but also convert dvd to mp4, DVD to MP3 AAC, rip DVD to MKV, DVD to WMV, MOV etc. if you need. Step 3: Specify an output folder on your computer to save the output files. Press the "Browse" button to choose the path where you want to save the output files in. Step 4: Start Conversion. After everything is done, just click the "RUN" button to start ripping DVD to AVI on Mac free, you could view the conversion progress and are able to cancel the converting process at anytime. In case you need to rip DVD to other video formats, for instance, rip DVD to FLV, DVD to MOV, DVD to MKV or DVD to iTunes etc and hope to play the DVD movie on QuickTime, iPhone XS/XR/X/8/7/Plus/6S/SE/5, iPad Pro/mini 4, iPod or Android based HTC, Sunsamg, PS4, Huawei, ZTE etc and require even more advanced video editing functions, MacX DVD Ripper Pro could do all that for you. Except the above mentioned free DVD to AVI ripping software working on Mac OS X, you may for sure want some other PC-based software that can convert DVD to AVI, MP4, WMV, MKV and other mainstream formats and offers many other awesome features. So just scroll down to find the most suitable ones for your DVD ripping needs. MacX DVD Ripper Pro: This software serves as not only a professional DVD to AVI ripper working under Mac OS X but also a top-choice DVD decrypter, DVD copy software, and video converter and editor that meet all your needs in DVD ripping. Whether you want to rip DVD to AVI, MP4, MOV, WMV, MKV, MPEG4, H264 or convert DVD to iPhone XS/XR/X/8/7/6S, Samsung Galaxy S9, this DVD ripper for Mac is competent for the task. 1. 5 minutes only to copy DVD Mac with no effort, thanks to its intuitive interface. 2. Built in DVD analysis module to decrypt the latest copy protected DVD, be it encrypted with CSS, region code, Sony ARccOS or Disney X-project protection. 3. The high qaulity engine ensures no video/audio qualtiy degrading, while multi-core CPU and hyper-threading technology guarantee up to 36X conversion speed. 4. 400+ preset profiles for almost all formats and devices, including iOS device, Android phones, tablets, microsoft gadgets, game consoles, and more. 5. Not only working under Mac OS X (macOS Sierra/High Sierra/Mojave incl. ), it is available for PC users as well. just free download DVD to AVI ripper on PC. Handbrake is no stranger as an open-source DVD ripper for PC and Mac. If you just use handbrake rip DVD with have no special requirements like editing, parameter settings, it is good for ripping DVD on Mac and PC. Sadly, Handbrake may crash when ripping encrypted DVDs and occasionally works with the aid of VLC, but frequently leads to audio video out of sync, no valid source found as well as other problems. 1. Easy to use regarding to ripping DVD to MP4 and MKV formats. 2. Handbrake is free and you can finish DVD ripping process without spending a penny. Warning: Please understand copyright laws in your country before ripping any copyrighted DVD. In some countries, you might be able to rip a copy of copyrighted material to AVI, MP4 and more for your own use under the concept of Fair Use. However, circumventing DRM (digital rights management) may be illegal in and of itself. Read the Wikipedia article on DMCA for more information. Rip a full DVD to AVI XviD/DivX, MP4, MP3, MOV in 5 mins only!